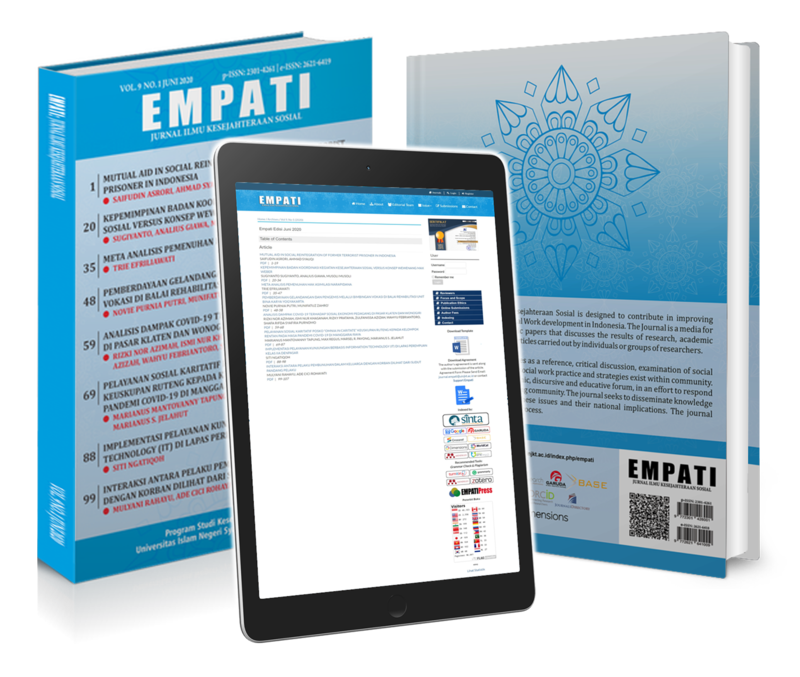 Empati: Jurnal Ilmu Kesejahteraan Sosial is designed to contribute in improving Social Welfare and Social Work development in Indonesia. The Journal is a media for publication of academic papers that discusses the results of research, academic studies, and scientific articles carried out by individuals or groups of researchers. The existence of this journal serves as a reference, critical discussion, examination of social problems, the different visions of social work practice and strategies exist within community. This journal presents as an academic, discursive and educative forum, in an effort to respond to the social dynamics of the growing community. The journal seeks to disseminate knowledge and to encourage debate about these issues and their national implications. The journal follows double-blind peer review process.